The pressure generation from flow reversal in the suction pipe, when the shoe or wheel hits the hose, depends on the length of the suction pipe. The pressure fall, and the height of the pulse that follows it, when the shoe or wheel lifts off, depends on the length of the discharge system. Pulsation and hose pumps is a system problem. No one can tell you how much pulsation has to be removed to enable your pump to work unless: The pipe system details are estimated and stated. TECH Notes: it is not necessary to read the areas shaded in this color. Peristaltic - from Greek "contractions and dilations (of a canal) moving a fluid". The inside radius of the pipe, squared x 3.142, is its cross sectional area, Section Area x length is its volume, Volume x Specific Gravity is weight that has to change direction in "shoe squash" or "lift off" time. The viscosity of your liquid adds drag, and so do number & type of "Ls" & "Ts" you choose. No one can calculate how much pulsation you need to have removed, without pipe detail. Pumps can't pump unless systems are smooth enough. 1. Grit. Scum, Sewage, almost anything other than broken tail light lenses, wire, in 4" balls of rag & paper - maybe pumped for miles, by the pumps below. Provided the pipelength, flow rate, r.p.m. 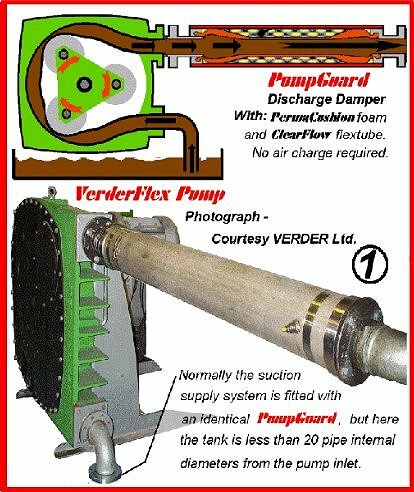 are fixed, then suction PumpGuard can be set for successful discharge use. 2. Suction lines run up to 75ft. / 23 meters, with huge pump priming and potential cavitation, problems that will cause even worse discharge pulsation. 3. A more normal application: 40ft. of 3" pipe in Yorkshire England - moderate potential pulsation. ANSWER: PumpGuard & ClearFlow FlexTube designed to allow 4" Diam. /100mm balls of rags & paper impregnated with broken tail light lenses & wire to pass into ENVIROTECH pumps!! Foam pre-fill (no air) enables PumpGuard to continue working even after laceration of its FlexTube. For details see WORLD PUMPS June Edition 1998. RESULTS: 1. No Sewers Overflow 2. Pumps can fill. 3. Smooth systems last forever! 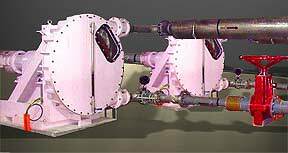 Pipeline reaction, to pumping action, is also reduced by having 3 off set pumps on one shaft.